Yesterday, Mother Nature decided to throw another curveball at us with a frost warning for the morning hours. It's amazing how quickly I became a big sissy when it comes to cold weather. Just a month ago, I would have been rejoicing for a morning ride if the temperatures were 40 or above. But not now that all my winter gear has been rotated to the bottom of the cycling clothes drawer. Not when my good friend Kurt has been sitting in the corner feeling like I forgot his name. Not when pulling Kurt from the corner would allow me to pick my clothes off the top of the drawer. After all, who knows what kind of injury I could sustain digging to the bottom of that 8" drawer. Pinched nerve, pulled muscle or torn bicep? I met up with Kurt and one of my training partners who will forever be known going forward as Quinoa. Having different agendas for our workouts he was chatty while I tried to fit sentences in between gasps of breath. While he was there I hadn't realized what a benefit it was to have him there talking. I never thought it was bad but didn't really put a lot of weight on it either. The conversation kept my mind from racing from one thing to another. "Gotta do this. Don't forget to do that. Are you going to have enough time to get this done for (insert 10 different names)?" All of those thoughts and more came rushing into my head after Quinoa's workout was done and he escaped to the gym. Having a terrible time focusing during my last twenty minute effort, I started talking to myself "Focus. Fo-c-us. FO-cus. FOCUS!" Then from somewhere I heard the voice from the original GI Joe cartoons, "Knowing is half the battle" As I battled to save my last interval from falling into the Cobra Clutch, my mind slipped away and I starting thinking to myself that I know mental toughness is more than half of endurance racing. That sticking through these workouts despite wanting to bag the last fifteen, twelve then ten minutes is what will pay the bills come race day. That internal conversation kept my mind from racing from topic to topic and saved this particular workout for me. It also reminded me how blessed I am to be training alongside and under a coach who preaches by practicing mental toughness on a regular basis. Which proposes the question, "Do you have the ability to push through the mental blocks?" 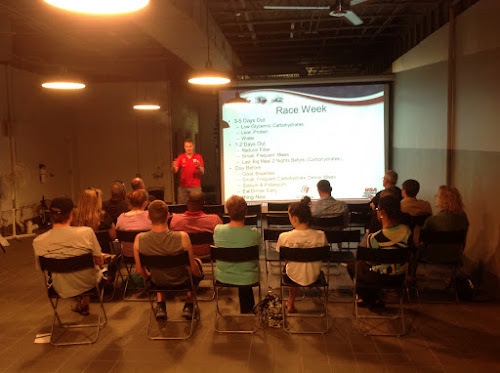 Tonight at Endorphin Fitness, Coach Michael Harlow will be presenting on Mental Toughness and it's role in not just endurance sports but how it can be translated into your everyday life as well. The presentation starts at 7pm and you can register for it by emailing register@endorphinfitness.com.